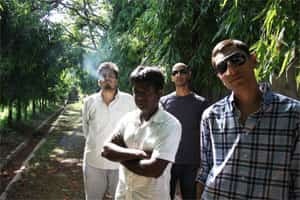 Back in August, on the day it released its debut album Maby Baking, as The Supersonics launched into its set of songs at Kolkata’s Big Ben pub, the audience could have felt overdressed for the occasion. On stage was a quartet of musicians playing insidiously punkish lines, wearing slept-in tees and workman’s check shirts and canvas shoes, with hair almost obligatorily cropped close. It was almost as if The Supersonics would have worn sandals to the release party had those been allowed. Such casualness—almost studiously so—makes the musicians sitting ducks for accusations of being reverse snobs. For anybody bearing such questions, the band provides a riposte in We Are We Are. In this track, the third in the album that record major Saregama has released, mellow guitar lines and a driving rhythm bring up the chorus where vocalist Ananda Sen sings And sometimes we know that we are we are we are. Take that. Another matter that here too, and in the entire album, Sen sacrifices his natural voice for a put-on baritone. It is a curiously self-absorbed space of music. You get it, or you don’t belong to the school. And if you’ve got it, helped no doubt if you are from the same upper middle-class, liberal arts background, you are welcome to The Supersonics party— “You know who you are", as a note in the typically unfussy album cover mentions. Ah yes, while at it, don’t go looking for mugshots of band members, that’s not quite their style. Most of these self-indulgent qualities get carried over in the album. Sen employs a statesman-like boom to deliver the songs, whispering, whining and occasionally swallowing through words—singing to himself, really. Even the production expertise of Miti Adhikari, brought over by Saregama from the BBC studios in London after having made his name working with the likes of Nirvana, White Stripes, Coldplay, Radiohead besides indie pin-ups Pixies and Pavement, isn’t sufficient to lend enough lung power to the vocals to make them rise above the music. Adhikari’s presence, though, keeps the dynamics of a primal live sound running through the album, as the rest of the band backs Sen with brutally sincere force—Rohan Ganguli’s frill-less guitar fills riding the locomotive energy of Nitin Mani’s steady bass lines and drummer Avinash Chordia’s ploughing rhythm in songs such as the fizzy Far from the human race and the infectious arena-rockers, Yeah whatever and In memory of. In an album that the non-committed can dismiss as repetitive, Blotter, a blatant ode to the charms of the blotting paper, is a standout mid-tempo track and also one where the vocalist finally emerges with his regular voice. There are no heroes in the album, no room for musical virtuosity either; just a band that is striving to be greater than the sum of its parts. It throws up no great musical revelations, though none can fault the band for not extending, even if by a little, the horizon of original rock music in India. That makes it a jolly good bouncy start. Maby Baking by The Supersonics is available on Saregama at Rs125.